On the evening of October 27, 2014, Joe Masi, Science Teacher at Sacred Heart High School, and I had our first successful observing run at the newly renovated Kohout-Dingley Observatory in Kingston, MA. This observing session was the first since the installation of the new Celestron 11 telescope mounted on a Losmandy Equatorial mount. Due to the unstable weather here in New England this fall, we have been challenged with finding a clear night to start getting acclimated with the new telescope system. Observing with the 11" Telescope. Joe and I figured we could do a dry run of with equipment before having the students present. I arrived at the observatory shortly before sundown. The waxing crescent moon was hanging in the western sky. As I waited for Joe and total darkness to arrive, I thought I would get a glimpse of the moon through the C11 for the first time. The full disk of the moon (due to earthshine) fit nicely in the field of view of the 23 mm Axiom 2" eyepiece. The optics displayed fine detail in the moon's terminator, especially when steady pockets of air passed allowing good seeing. When Joe arrived at the observatory, I still had the moon in the eyepiece that allowed him a chance to get a good look of the moon as well. Joe was just as impressed with the optics performance as I was. As the sky became darker, we configured the telescope and mounting system so we could utilize the Gemini 2 GOTO system. Once we completed the two-star alignment method with the GOTO system, our goal was to slew our way up through the summer Milky Way. The first targeted object was M8, the Lagoon Nebula. The object was so slow in the sky; the nebulosity was faint due to the murkiness of the horizon. 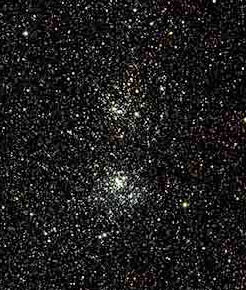 The next object of choice was M11, the "Wild Duck" open star cluster in the constellation of Scutum. We then observed common deep-sky objects in the summer Milky Way such as M57, The "Ring Nebula" in Lyra and M27, the "Dumbbell Nebula" in Vulpecula. I noticed the constellation of Pegasus was getting higher up in the sky and knew we could get a good view of M15, a nicely condensed globular cluster that rivals M13, the Great Globular Cluster in Hercules. Joe very impressed with this deep-sky object commented on how bright the cluster was. As we winded down our observing session, we ended with a nice view of M31, the Andromeda Galaxy and the double open clusters NGC 869 and NGC 884 Cluster in Perseus. As Joe sat in the observing chair comfortably, he could detect the difference in the colors of some of the stars. Content with this successful dry run, Joe and I then closed up the dome and parked the new telescope system. This observing session inspired us to introduce the students in the school's astronomy club and science classes to this newly renovated observatory with its new state-of-the-art instrumentation.